Week #7 of 48 Weeks of Historical Craftivism, Knitting and WWII! By Betsy on March 31, 2014 in #HistCraftivism, activism + protest., charities + orgs., crafters + makers., craftivism., knitting. “Week” #7! Knitting and WWII! I know that many of you think you already know a lot about this subject, so I’ve tried to dig up some gems that you may not already know about… But first, this amazing gem from the 1943 film Mr. Lucky, where we see Cary Grant… knitting… for the war! The knitting was done as much for morale as for practical purposes. It gave people a way to feel that they were contributing to the war effort — similar to Victory Gardens and scrap metal drives. Of course, none of these three activities was exclusively symbolic: all three of them served to support the war effort and free up resources needed elsewhere. How knitting was used as code in WW2: During the Second World War the Office of Censorship banned people from posting knitting patterns abroad in case they contained coded messages. There was one occasion when knitting was used for code. The Belgian resistance recruited old women whose windows overlooked railway yards to note the trains in their knitting. Basic stuff: purl one for this type of train, drop one for another type. This newspaper article is about a Mexican woman in the United States who used her sewing skills to support her sons fighting in the U.S. Army. 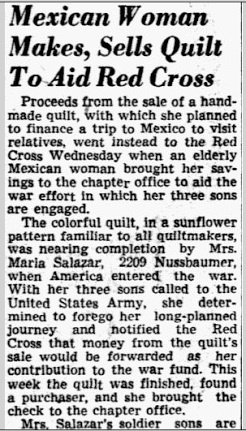 The quilt Mrs. Maria Salazar made was originally going to be sold to finance her trip to Mexico to visit relatives, but she reconsidered and donated the money to support the efforts of the Red Cross and ultimately of her three sons fighting in the war. Her name, address and the names and ages of her sons are listed in the old newspaper article. 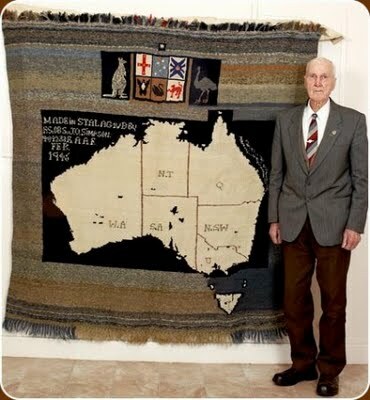 The amazing story of Jim Simpson, who was a WWII POW who knitted this sweet rug. More here. During the War the Women’s Institutes and other patriotic ladies held knitting circles, influenced by the slogans on the hoardings, etc, with the reminder that “If you can knit — you can do your bit”. So they knitted for the Army, Navy, Air Force and ARP workers. Knitting patterns were printed called “War Knitting” and Sirdar Wool Company produced wool specially dyed in service colours, i.e. khaki, navy blue, Air Force blue and grey. They knitted pullovers with long sleeves, sleeveless pullovers, gloves, balaclavas and other garments which were lovely, cosy and warm. Women have always knit, but in wartime, knitting was one of the ways that women could show their patriotism. During World War II, the United States harnessed this energy with the campaign, “Knitting for Victory”. Eleanor Roosevelt launched the effort at a Knit for Defense tea held at the Waldorf-Astoria in New York in September 1941. There are many photos of Eleanor Roosevelt knitting – she merits an exhibit of her own. 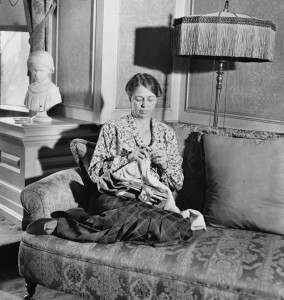 In the meantime, here’s this comfy photo of her knitting while she still resided in the governor’s mansion in New York in 1932, just before FDR became President. World War II: Knitting became more of a civilian job as organizations like the American Red Cross pushed it as a way for those on the homefront to contribute to the war effort. 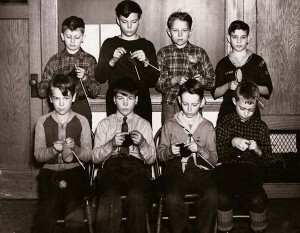 Many civilians formed groups like the Little Norway Knitting Club in Butte, Montana (pictured below) to create socks and sweaters for soldiers. However, there are also records of soldiers held prisoner in Germany unraveling their own sweaters and reknitting them into socks with improvised barbed wire “needles” – knitting was not demilitarized yet. 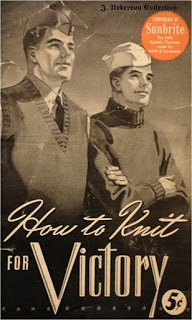 Many of the earliest knitters for World War II had knit for Victory as children or young adults during World War I. Knitting was for them a natural and immediate response to war. “The men hardly have time to grab their guns before their wives and sweethearts grab their needles and yarn,” claimed Time on July 21, 1940. Knitting provided warmth and comfort for the soldier and therapeutic distraction for the knitter. 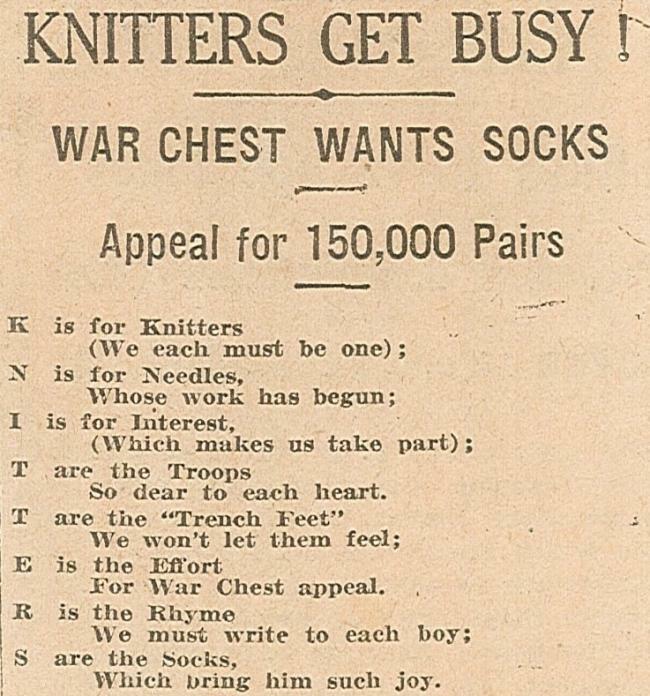 Week #6 of 48 Weeks of Historical Craftivism, WWI Knitting! Week #8 of 48 Weeks of Historical Craftivism, Knitting and the Vietnam War! 3 Responses to Week #7 of 48 Weeks of Historical Craftivism, Knitting and WWII! Just saw your post via the Knitty Blog link and what a great collection you’ve put together! Thanks for clicking over from Knitty and for your kind words, Grace! I’m so glad to hear you’re enjoying the posts!